Fantastic, vibrant Chantrell artwork feature on this exceedingly rare country of origin UK quad poster for 50s spy thriller. Actual size of poster is 29 3/4 x 40 inches. Some tears, pinholes and minor paperloss. Writing on back, no bleed through. For further details or information on backing or framing of this poster please see our website Orson & Welles. 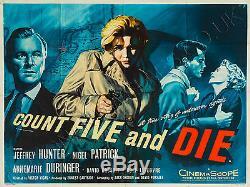 The item "Original Count Five and Die 1957, UK Quad, Rare Chantrell Film/Movie Poster" is in sale since Wednesday, April 23, 2014. This item is in the category "DVDs, Films & TV\Film Memorabilia\Posters\Originals - UK Quads\1970s". The seller is "orsonandwelles" and is located in Bath.